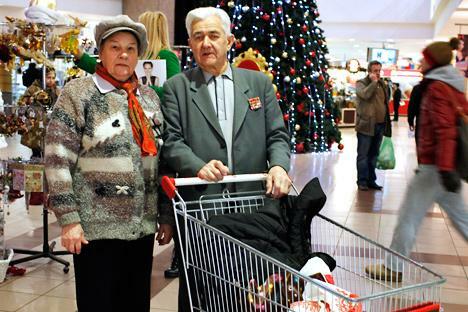 “Ogonyok” magazine asked Muscovites what they hope to receive this holiday season. For the New Year, we mostly buy presents and New Year decorations. We are very fond of hand-painted Christmas tree ornaments. We’d like to keep them for a long time – so our children might still enjoy them years from now. We don’t spend much on groceries, however, for we usually eat out with our friends for most of the holiday season. Our dream for the coming year is to have a baby! For the New Year, I buy everything my wife and my two kids want: toys, clothes – anything at all, no objections. For our New Year celebration, we will have chocolates, cakes, fruit – no alcohol, though. I would really like to make more money – the kids are growing up, they ask for more and more every year. For the New Year, we buy various decorations – mostly the type you can refashion and give your friends as presents. We are also now looking for a piglet to roast for the New Year dinner. The coming year will be very difficult – and we are saying this as financiers. So we don’t have any dreams for the year; we are just preparing to cut back on our spending. For the New Year, I buy mostly groceries, and usually at the last minute. The most important thing here is to be careful with the labels: grocery stores often try to get rid of food products with expired ‘best before’ dates. What’s your dream? I want no troubles next year: I’m sick and tired of shuddering every time at the thought that tomorrow I might be left without money or a job. For the New Year we buy just a few groceries. We don’t need much. A spoonful of salad, a mouthful of fish - and that’s all. It’s better not to plan anything for the coming year but rather thank fate that we are still independent, that we can go to a store on our own and choose where and how to celebrate New Year. This is happiness, isn’t it? For the New Year, I buy presents mostly for myself – dresses, shoes, handbags. I haven’t bought any groceries yet, though, because I don’t know so far where I’ll go for the celebration. I dream of a prince on a white horse and a million dollars flying into my window! Seriously, I want to find a job that really suits me. And, naturally, peace in the world. And fair elections. First published in the Ogonyok magazine.